What patients have to say about Select Health and Wellness, broken up categorically according to how we helped. "Thank you Select Health and Wellness. I am doing great and feeling awesome. I am now living pain free and I am able to work out harder than ever. Now that I can work out harder, I have lost 18 pounds in the last three months since coming here. It shows that the staff cares and loves to help people. Thank you again." 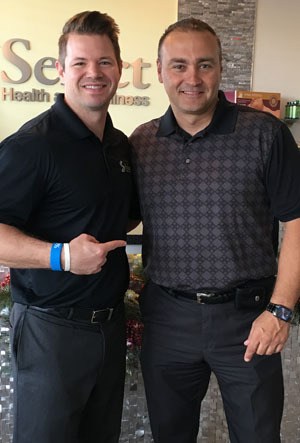 Chris S.
​"Upon meeting Dr. Fritz and his staff at a charity event I had the opportunity to discuss some posture issues I had been having for most of my life. I was encouraged to come in for an evaluation like non other I had ever had; incorporating scans, x-rays and an exam. Dr. Fritz listened to my descriptions of pains, headaches and inflexibility. 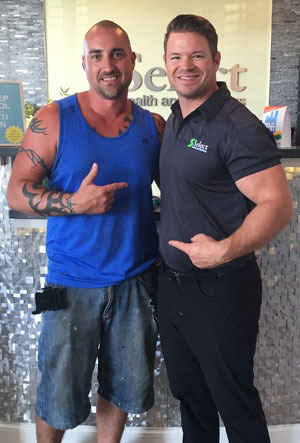 He outlined a comprehensive treatment plan and I was more motivated than ever to see what kind of changes I could make. Adjustments, massage, and yoga have made a significant improvement in my overall health, I have no more headaches, I have improved flexibility and I don’t even think about my pain level anymore! Thanks for all the care from Dr. Fritz and staff!” -Joann C.
​"After visiting with Dr. Fritz and his amazing team I've noticed tremendous improvements in my overall life. Learning how to stretch and taking notice of various methods to better myself. Before coming here my posture was awful. I felt beaten down everyday. Getting out of bed was a challenge. Easily my biggest accomplishment was this weekend at the Tough Mudder; I went from just being able to keep a slow jog/walk to being able to sprint/run for the first time since childhood. Words can't begin to describe how thankful I am for every member of this team. 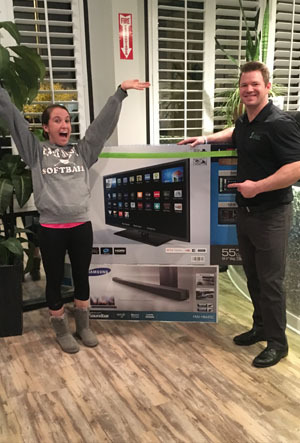 "-Josh S.
​"I received a card to come to Select, Leah and my husband kept on bugging me, so after a few weeks I cashed in on my card. I came in and got my scan and found out some information related to my sinuses. I had no idea that my sinus issues were interrelated with my other physical issues and functions. I received treatment from Dr. Fritz and he has helped me with my sinus issues. I had a hard time doing CrossFit and breathing. Now I can get through a workout and still be able to breathe. It has helped me tremendously! So if you hear me say "crack a' lackin", it is a good thing! Now, get up and get off your booty and get to Select Health and Wellness to get your crack a' lackin' on! If you thought you feel great now, wait till you get there and see how much better you will feel. I can honestly say I can smell the roses, no more sinus issues! Bye, bye booger nose! Hello drainage and breathing better. Oh, I can't forget how much better my squatting is too! They helped me get better at CrossFit too! If you ever had a doubt about trying non surgery first, do it. It works. I promise I am so sure you will feel better that I will personally come to your session, cause they love me there! (Selfies included!)" -Michelle C.
​"In May of 2016 I didn’t come in for pain. I ran into Sarah at a block party and decided to see if anything could be done to help with my athletic performance. I had started eating clean in March, had a supplementation regimen set, and was exercising 3-4 times a week and had already seen signs of decreased anxiety and stress from these. I was very excited to see if adding chiropractic care would increase my overall health. In September of 2016: I have come off of anti-depressants completely and can feel an overall reduction in my stress and anxiety levels. I’ve “grown” an in inch now that my spine has straightened out, and my athletic performance has dramatically improved. Coming off of the anti-depressants happened a lot faster than I thought it would but went a lot better than other people thought it would. I saw a decrease in my anxiety within a week of starting care with the Select Team and I know I wouldn’t have gotten so far so fast without their help!." -Katie S.
​"To share my success story, I would have to share my life before my one-day piano moving career. I have never been intimidated by home improvement projects for myself or others. Want to know how to tile? No problem- I have all the tools, I’ll even help! My business partner and I decided we were strong enough to move a piano. Later that night, I was in Urgent Care for the third time in two years with muscle spasms. I was given muscle relaxers and told to rest for a few weeks. "I went to Select Health and Wellness within the first week of my piano moving retirement and I am very glad I did. I had been to a chiropractor 10 years before, but was so much more impressed with the layout of Select. To have therapy, massage and chiro all in one stop fit perfectly into my busy schedule! The customized care plan they put together is using their entire arsenal to correct the many problems in my joints, nerves and muscles. The entire Select team is energetic and fun to be around. Service is as quick as they can make it, and always professional! 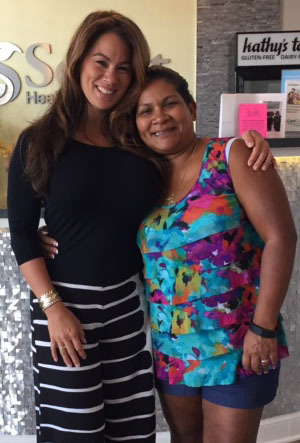 "I have been under the care of Dr. Fritz and his team for just over a month. After being in active rehabilitation and getting adjusted multiple times a week, I’m in much better shape. I don’t have the constant ache in my lower back. My neck has had huge improvements, with still a ways to go. I am also learning ways to stretch out correctly and I’m slowly getting back to my workout routine. "Although, I’ll never move another piano, I haven’t retired from moving furniture and taking on big projects. However, considering how much better I feel now compared to my pre-piano moving days, I will do a much better job taking care to practice what I have learned and listen to what my aches and pains are telling me. 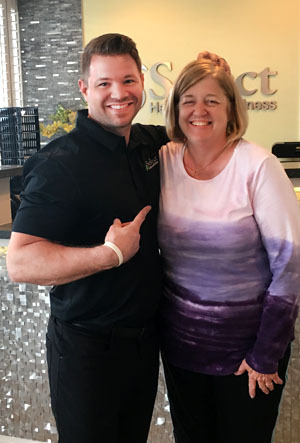 I am very grateful for the team at Select Health for snapping me back into shape and I look forward to a #LifeWithoutLimits" – Jeannie H.
"Having never been to a chiropractor, I was very skeptical. 3 months later, I'm a believer! I no longer take medication for sleeping or any anti-depressants! I am almost pain free! I have a more energetic lifestyle and am much more active. I feel wonderful! Thanks Dr. Fritz and staff!" 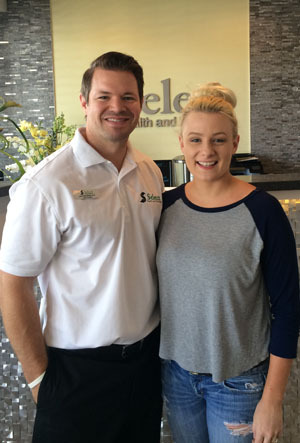 – Salli W.
“I started seeing Dr. Fritz in April of 2016 with horrible sciatica and neck pain. I was experiencing daily pain going on two years and just never took the time for myself. I had no energy for my family, and was always tired and drained. When I saw my initial scans and x-rays I knew I needed to finally put myself first. 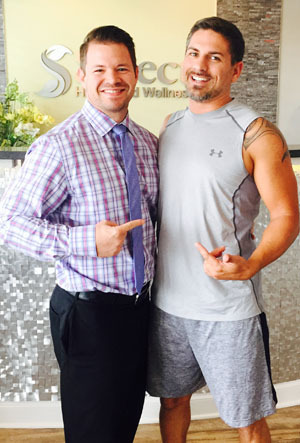 After just four weeks into my treatments, my sciatica was gone! :) My neck pain improves weekly. Dr. Fritz and his amazing staff have given me my life back! I now have energy for my family and daily activities. 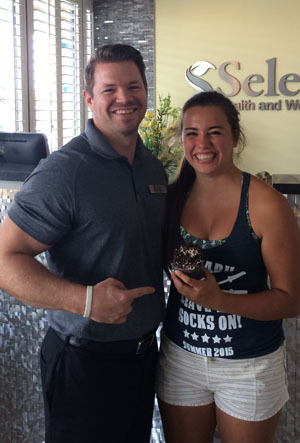 Thank you!” -Erin R.
​“I first came in to Select on the advice of a work-out buddy. She raved about the staff and Dr. Fritz. Now I know why; they are awesome! I’m now being seen for a car accident that injured my neck and shoulder. It’s been two months of treatment and I can say the pain has almost disappeared! Dr. Fritz and his “magical hands” are GOLDEN!! I haven’t felt this way since I was in my early 20’s! I have energy, stamina and strength. 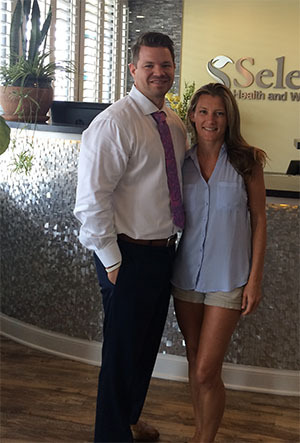 Thank you, Select Health and Wellness” -Miriam M.
Select Health and Wellness treats dozens of patients, just like you, with tremendous success. Meet some of our patients and read about their life-changing experiences. These are the sort of success stories that the Select staff make possible every day! "Relentless migraines led me to find alternative treatments beyond traditional medicine. Three chiropractors later, with some relief, I found Dr. Fritz. In the past two months with Dr. Fritz and his team I am finally finding relief. My pain level is zero now. These migraines would interfere with my life frequently keeping me from doing the things I needed to do. Not only did I find immediate relief with my migraines, but my overall health has improved. Thank you to Dr. Fritz and all the health team!" – Laura S.
​"Dr. Fritz and his team offer excellent, friendly care. When I first started visiting the office there was a lot of tension and discomfort, especially in my neck and back. The doctor set up a specialized plan for me after using his thermal scanner and performing a full assessment. They were willing to work with my needs and schedule to find a good plan for me. After a month I am feeling fantastic and had an excellent follow-up scan and exam. 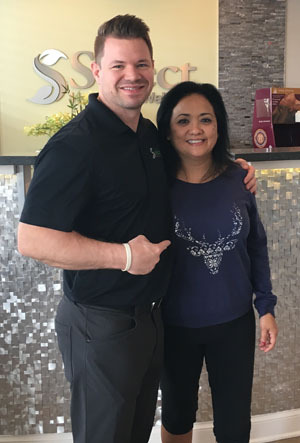 Select Health and Wellness truly has the patient's best interest at heart!” –Michelle S.
"I started out with a sharp pain in my upper back and headaches from my neck pain. After Phase 1, my back pain is gone and my headaches are few and far between. 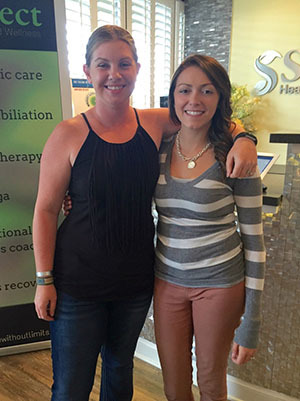 I'm looking forward to Phase 2 and being completely pain free." 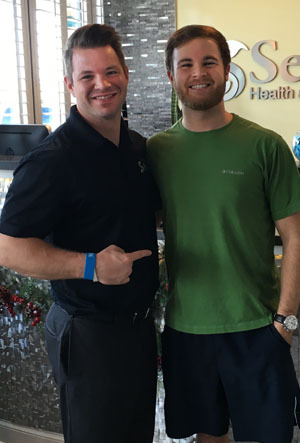 - Travis M.
"Six weeks ago I came to Select Health and Wellness in severe pain. I am a personal trainer and mom of two children. One of my children has special needs. He requires a lot of lifting which lead to my lower back pain. I also had severe shoulder and neck pain. The best decision I made was to pick up the phone and call Dr. Fritz. The office is filled with compassionate, professional and genuine people. Six weeks later I am pain free and my quality of life has vastly improved. My workouts are more successful and I have more patience with my children. I am continuing with Dr. Fritz for as long as possible. 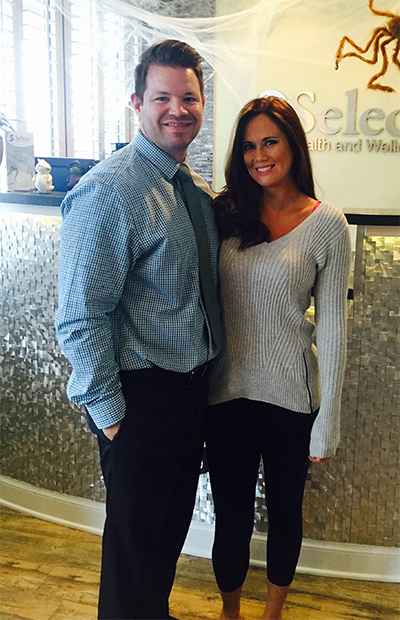 Thank you to everyone at Select Health and Wellness for making me feel like part of a big family." -Kristi S.
​"I have had a horrible headache for 3 days and a stiff neck. I had my regular weekly adjustment and mentioned it to Dr. Fritz. He had me lay on my back, felt my neck, then adjusted it. It made three cracking noises and instantly it was better! :) What a relief! He is a fantastic doctor!" -Vicky B. Before starting treatment I had been dealing with constant back, neck and shoulder pain. After a few months of therapy and adjustments the pain is virtually gone and the consistent discomfort is non-existent. 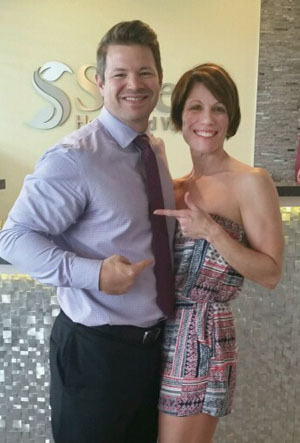 Thanks to Dr. Fritz and staff I am able to start golfing and working out again and I couldn't be happier!" - Ben N.
"I woke up one morning experiencing severe shooting pains down into my heels, muscle spasms in my calves, stinging pains in my arms, tingling in my fingers and numbness in my shoulder. Like anyone, I was immediately concerned and headed off to my doctor who ordered immediate MRI's and nerve conduction tests. The results of which determined two compressed disks. My doctor sent me to a pain clinic, but after visiting them, I nixed their therapy because they wanted to give me shots along my spine. An orthopedic doctor wanted to do an operation and I also nixed that especially when my daughter who is a critical care nurse told me not to do it. What was I to do at this point? After again talking to my doctor about any other options he recommended that I see a Chiropractor. That is when I "Selected" Dr. Fritz. I admit I was a little nervous about having my spine adjusted, but after meeting with him, I consented to move forward with the therapy he recommended. At first, after the initial adjustments, my pain seemed to intensify, but with Dr. Fritz' assurances that they would subside I kept at it. Today, I o longer have any shooting pains, numbness in my fingers and shoulders and feel so much better. I still get some random minor stings in my feet but I expect that with a little more time they will be gone as well. Quite honestly my spine looked like I was the crooked man that walked the crooked road. He also determined that my right leg is about 7 millimeters shorter that my left which he has adjusted with a lift. I am very glad that I came to Select for my therapy because, I am getting healed without surgery or needles to my spine. I will continue to come to Select for the adjustments that have been life changers for me. I will tell you that the pain I experienced on a scale from 1 to 10 was at least an 8 or 9 at times. Now those remaining random stings are no more than a 1 or 2. 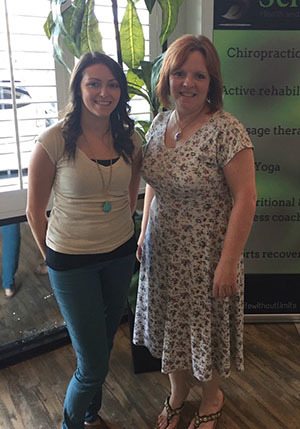 "Over the last several years I've experienced increased neck/back pain & discomfort. I initially deferred treatment even after my scans and xrays showed I really could benefit from it. I am so glad that I went back and decided to do it. It has now been 4 weeks, and I do still have some intermittent tightness and soreness. I no longer have back spasms and discomfort that prevents me from sitting or laying comfortably. 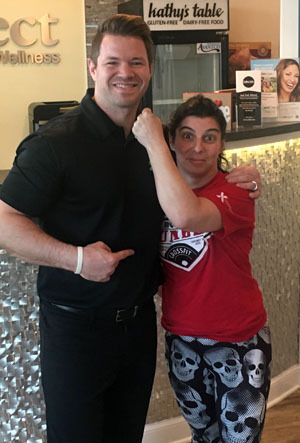 I feel like my posture has improved to what it once was and don't feel so weighed down, I am very pleased with my progress here, as well as with the amazing staff & Dr. Fritz. Everyone has been so welcoming and supportive, helpful, & flexible. Thank you all so much!" - Margaret W.
​"I came into Select Health and Wellness with Sciatic nerve problems that I had been experiencing for years. I was also experiencing neck and shoulder pain from TMJ & grinding my teeth. After a few weeks of working with Courtney doing active rehab, I started to see a difference! Running became much easier and I was no longer waking up with back pain. 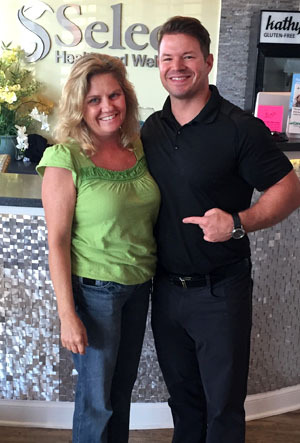 Dr. Fritz's adjustments didn't just help my back, they helped my sinuses and headaches as well! Select Health & Wellness has been a fantastic experience!! The staff is always friendly & always encouraging!" 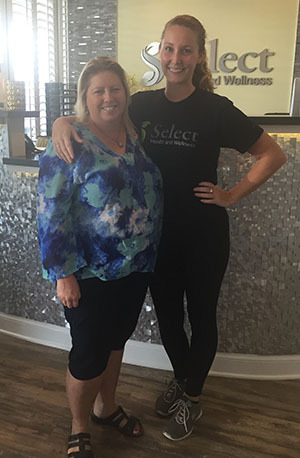 - Sara W.
"When I first came into Select, I knew my mobility was horrendous and my joints were inflamed and in pain, but I always pushed the feelings and urges to do anything about it to the side. My lower back felt like it was paralyzed any time I would hyper extend it, and my knees were in constant pain from tendinitis. Then Select helped me to recognize that it wasn't Cross-Fit that initiated the pain, t...hey discovered my irregular leg length to be the root of the problem. Mobilizing my hips, and getting the correct size heel lift pretty much solved everything. Every stretch I was explained, and it helped me become knowledgeable as to why it would benefit me. The one-on-one ratio makes every stretching rep pushed to perfection. I've loved this place the whole time and look forward to every appointment. Now that I'm out of intense pain I am looking to prevent any more, and I know that if I have any questions they are always here to help me. 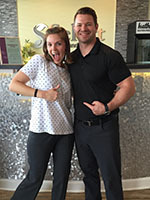 The people I have met that work here will always mean a lot to me and I'll never forget them!” –Taylor H.
​ "Before I started my wellness regimen at Select Health and Wellness, I had all but given up on the thought of ever having flexibility in my lower back and ever losing the pain in my neck and back. Those gloomy thoughts all changed after Dr. Fritz keyed in on my core issues and made an effective plan to reclaim my body. I was as flexible as an oak tree when I started, but gradually, by using my body to heal my body; my flexibility started to increase tremendously. The pain I had complained about for years had become nothing but a memory. My work days become more productive due to increased energy, relief of pain on my nerves, and a new range of flexibility. Literally, within a few weeks my body had gotten back to the place it was in my teen years, but better. I can now touch my toes, stand up for hours without end, and not be knock-down drag-out tired after long days. I am 24 years old, but I was in worse shape than most folks' grandparents. 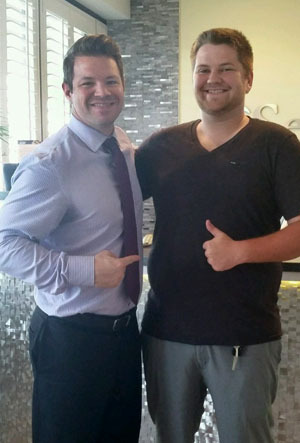 With the help of Dr. Fritz and his staff, I have reclaimed my youth; and that's priceless." -Angel K.
"Fifteen years ago I suffered a significant back injury that left me paralyzed and required spinal reconstructive surgery. I went from a life of great activity to only being able to walk, on Doctor's insistence. Living with extreme physical pain and lack of physical activity, I became very overweight and unhealthy. In just five weeks' time, Dr. Fritz and staff have proven to me than an active and pain-free life is still possible. I have lost significant weight, have much more energy, have not taken any allergy medicine in four weeks (unheard of for me) and -most incredibly - am already almost completely pain free! Their knowledge, experience, warm and caring support are of extraordinary quality and I am grateful for being led to this clinic. 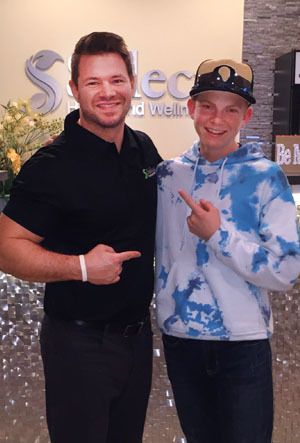 Thank you Dr. Fritz and everyone at Select Health and Wellness!" -Demaree W.
​"After giving birth to my daughter over a year ago, my chronic lower back pain had gotten progressively worse. My best friend suggested going to see Dr. Fritz and his team at Select Health. Best. Decision. Ever!! Not only have they helped me manage my lower back pain, they have corrected other areas of pain and tension (neck, shoulders). I would recommend Select Health and Wellness to anyone having pain or anyone looking to feel better a whole!" -Emily S.
"I was diagnosed with scoliosis over two years ago and didn't know where to go from there. Select Health and Wellness is where I should have been this entire time. Before coming here I had regular upper back pain and consistent migraines. Seeing my initial scans was a scary wake-up call as to what gymnastics had done to my body. My neck wasn't curving the right direction and I had no idea. Within one week of treatment here I already felt a difference. I can stand all day at work now and my back feels great. I have not had a single migraine since I started treatment two months ago. I am extremely happy with my results and how great I feel. Thanks Select Health and Wellness!" -Erin K.
"I came to Select Health and Wellness after a friend's recommendation. I have always had back and knee issues and even developed a limp when I walked. My pain started to get more severe and even affected me when I tried to sleep. Dr. Fritz had an x-ray and a scan done, and we found that my hips were vastly uneven, among other things. He started giving me back adjustments and realized I needed more correcting. 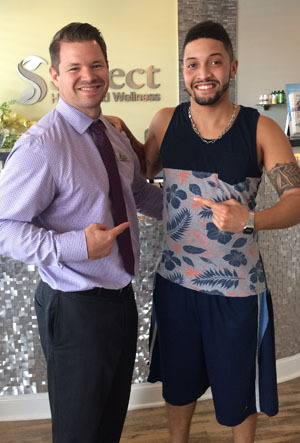 Vicente worked on loosening my tight muscles, and rehabbing my back and knee. After a few weeks I was noticing my pain becoming less severe. Six weeks later I barely have any pain in my knee or back. I am extremely grateful for the care and attention they showed me, and for their concern. Not only did they help relieve my pain without drugs or surgery, but they made me feel like family. Everyone in this office is extremely kind, and just fun to be around." - Anna P.
​"I started my treatment by a referral from a friend. I came in with lower back pain and Dr. Fritz and his team has helped improve my lower back pain. Meanwhile I had pain from a surgery on my foot and the wonderful therapist worked on it and now am able to move my toe and am not in so much pain. I would recommend Dr. Fritz and his team to all my friends. From the office staff, to therapists, to Dr. Fritz, they are all great! They take their time to figure out your pain and to correct it. Thank you." - Valerie A. 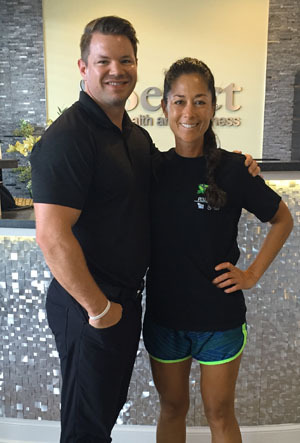 ​"I started having lower back pain in February 2015 after an exercise injury. I ignored the pain as much as I could, and only took mild pain-killers from the urgent care center. After a road trip to and from Fort Worth, TX, the pain flared up exponentially worse than it had ever been. I decided to try something different, so I took advantage of an offer from work and made an appointment with Dr. Fritz. It turns out, I had lower back subluxations that led to nerve issues. But to my surprise, I also had terrible tension in my neck! I never thought much about my constant neck pain, and figured it was all stress-related. 3 months into treatment, my neck pains have significantly decreased, and thanks to a job change, my stress level has improved indefinitely. I have achieved something that I didn't think would have been possible with standard medical treatment alone. 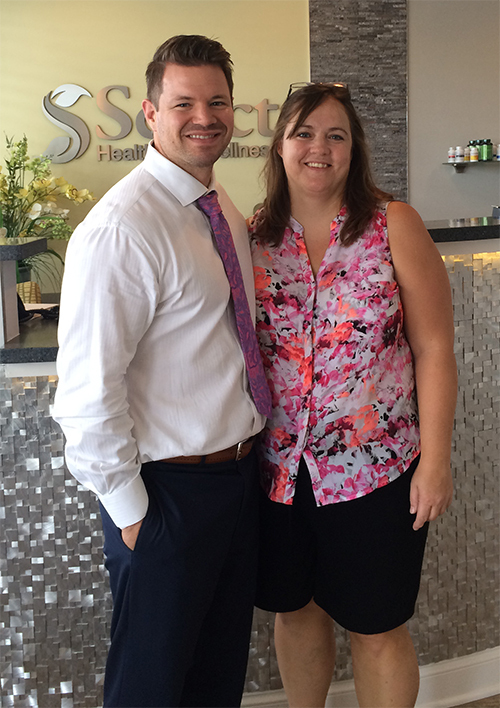 The team at Select Health and Wellness is amazing and I'm so thankful that I decided to make this change! - Maria A. ​"I came to Select by recommendation from a friend/co-worker. The pain in my shoulders and lower back was bearable on a good day, but had me in tears by the end of a long work week. Sitting was uncomfortable, and I had gotten used to the fact that I just had to tolerate pain and discomfort every day. The worst part of all is that I had given up on working out because I did not want to increase the pain in my legs and back. After a few weeks of active rehab and adjustments, I was back in the gym. I am running again, and growing stronger every day. My flexibility has increased. The only pain I feel is now from a hard work out. 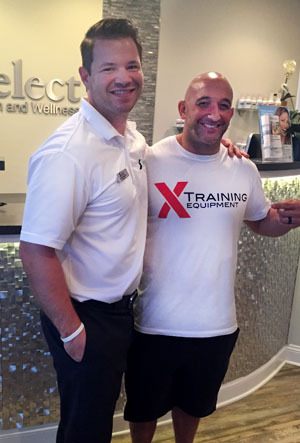 Thank you, Dr. Fritz and the Select Team for making me strong and healthy. I no longer have to tolerate daily pain- instead, I am ACTIVE and flexible with increased energy and immunity!!" 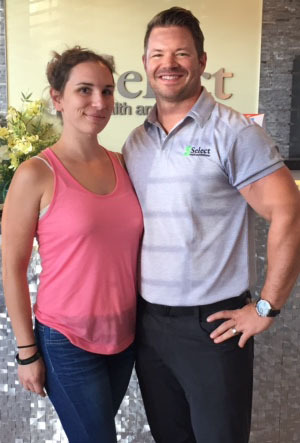 - Kristina W.
"I have been going to physical therapy for 9 months, but in the last 3 I started going to Select Health and Wellness. I began to give up hope because I went to 4 other Doctors before Dr. Fritz. None could find what was wrong. 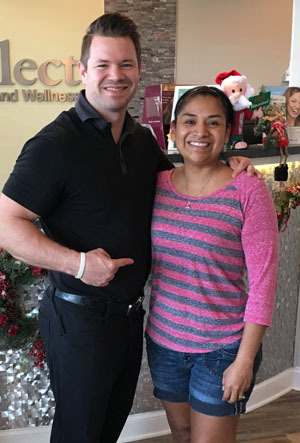 I came to Dr. Fritz and we began physical therapy and chiropractic care; with in the first month I felt better than ever! I continued with the physical therapy, and have been able to play volleyball again and do things I have not been able to do in over a year! Overall, Select Health and Wellness is a great place to go for injuries. All the staff are so nice and personable. 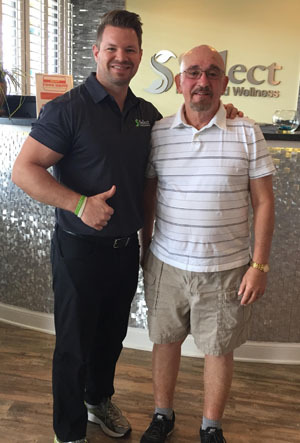 One of the best things about Select Health and Wellness is that they are very personal and adjust each rehab treatment just for you. 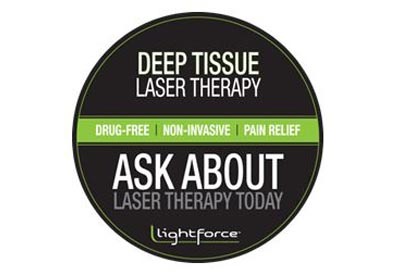 I highly recommend coming here!” –Leah C.
​"For years I have had to deal with numbness and tingling in my hand. Just doing simple task would cause my hand to fall asleep. Things like doing dishes, writing, driving, cleaning and working on the computer. It would even wake me most nights. My hand was sleeping, but I was not. Over the last year my shoulder and neck were even starting to cause me pain and discomfort. It was becoming quite frustrating and beginning to effect my everyday life activities. It was to the point where I knew something had to be done. Then I met Dr. Fritz and Taylor at a community function. Being the skeptic that I am they had to convince me to come in for an evaluation. Dr. Fritz did a thorough exam, including x-rays and showed me where I had some problems with my spine. he game me a plan for adjustments, therapy and MASSAGES! That was 12 weeks ago, and I am happy to say I no longer have numbness and tingling in my hand. No headaches, neck pain, or shoulder pain. I have so much more energy that I am able to get a lot more done every day. I sleep through the night with no numbness. I am very grateful for the care Dr. Fritz has given me, and for the relief of pain and discomfort. His staff is amazing and makes everyone feel special. you won't find a more supportive group of people. I am excited to see how much more my health will improve over the next year!" -Janet H.
"After a neck injury I began coming to Select for treatments. Not only have they helped rehab my neck, but increased my mobility and range of motion in many areas. As a weightlifting and CrossFit coach I send all my athletes to Select for preventative maintenance. A wonderful staff with all the tools to help you maintain a healthy lifestyle." 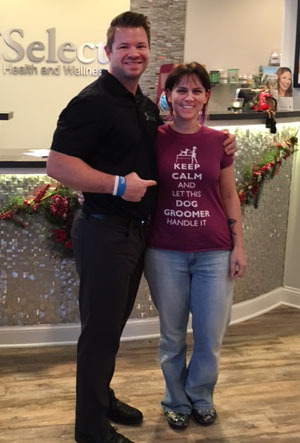 -William D.
​"I came to Select Health and Wellness with acute back and shoulder pain that had accumulated daily due to my occupation (I am a dog groomer). The doctor did a thorough job of diagnosing my problem areas and came up with a customized wellness plan to address my issues. The treatment has gone exactly as planned, even with a lack of "homework" participation on my part. I now have drastically decreased my symptoms, and those that are still present have an exponentially better range of motion and flexibility. all staff members are extremely knowledgeable, helpful, and friendly. I would recommend Select Health and Wellness to anyone suffering from back, shoulder, or neck pain." 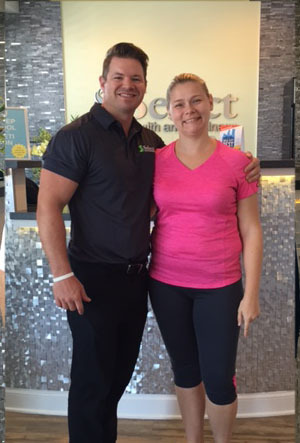 -Meghan K.
​"When I first heard about Select Health I was extremely weary about coming . I was not sure about coming to see a chiropractor. II can honestly say, it is one of the best decisions I have made. The difference I feel is remarkable. The pain in my back, knee and neck is gone. I can not recommend Dr. Fritz and his staff enough. They also treat my daughter. She is very athletic and seen a huge difference in both her performance and mobility. He really is the best!." 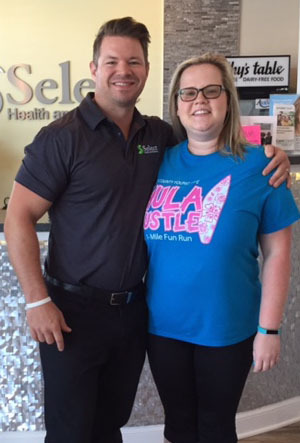 -Kyla G.
"I came to Select after my rotator cuff surgery and physical therapy to get back my range of motion in my shoulder, as well as work on my overall flexibility. Since starting, my flexibility has increased a good deal, my squats are ALOT better, my overall flexibility during workouts has also increased to a very noticeable level. My primary shoulder concern has gotten much better, as range of motion is coming back. 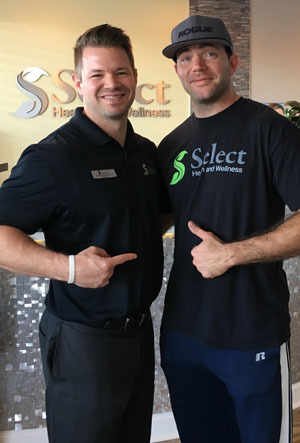 I am looking forward to getting back to competing in CrossFit competitions and I think Select has given me the flexibility I never had before to be a better competitor, as well as live a more healthy lifestyle." 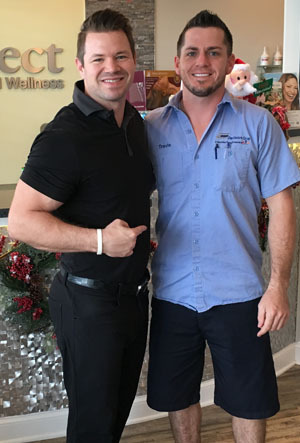 -Keith C.
​"I have been under the care of another chiropractor for a frozen shoulder, but wanted to find a provider located in Fleming Island and one who offered total care and wellness. Dr. Fritz took the time to listen to my concerns, review all of my test results and thoroughly explained my treatment plan. It definitely put me at ease about making the change to a new chiropractor. 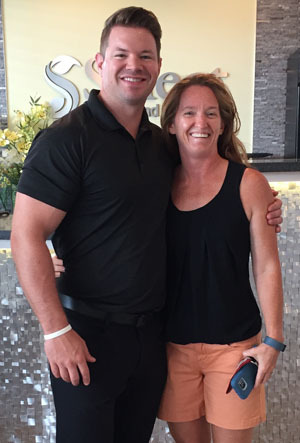 As I recently finished my first phase of treatment, the pain and stiffness in my shoulder has substantially decreased, range of motion increased and I am feeling stronger every day. Dr. Fritz and his entire staff's passion is reflected in the way they interact with and care for their patients. Everyone's so upbeat, energetic and friendly, which makes for a more positive experience and helpful in my healing process. 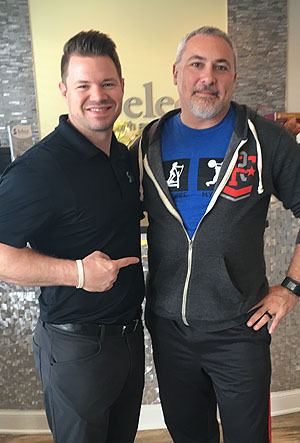 I am hopeful that I will regain full range and be pain free as I continue my rehab therapy, massage therapy, and adjustments that Dr. Fritz has outlined for my next phase. Thank you Dr. Fritz and Select Health for your excellent patient care!" -Debby P.
"Prior to coming to Select Health & Wellness I was pitching around 69-70 mph. My pitching was inconsistent due to my shoulder pain. Yesterday, I was on the mound for the first time since being a patient of Dr. Fritz ad I am proud and excited to say that my pitching was the best it has ever been. Not only was I extremely consistent and "sitting the batters down" one after another, my coaches clocked my throwing at 80 mph! 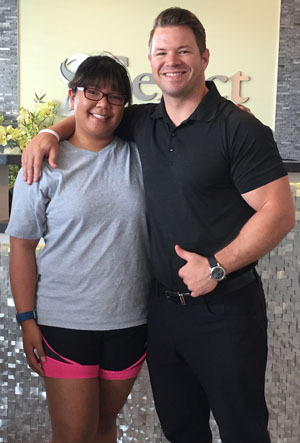 Thank you, Dr. Fritz for all the adjustments and advice and thank you, Leah for all the awesome active rehab sessions that have obviously paid off." -Dawson C.
​"When I first came in I could not move my arms and could not take a step without pain. I have not had back pain at all since my third adjustment. My neck is feeling much better, although I know keeping up with therapy is very necessary. It is such an improvement since I have been receiving recovery adjustments. It has made a huge difference in my life, my attitude, and my overall mental and physical health." - Christy S.
​"I started at Select Health and Wellness in early May upon recommendations from several of my friends. I had shoulder pain since 2013 and after seeing Dr. Fritz and his staff in the rehab department, my shoulder pain is gone. Amazing, for just just 5 weeks. Dr. Frit's office is very modern and he uses the latest technology. I feel very comfortable with his level of expertise so much that I have every one of my family members coming to see him. He's super friendly and energetic, and always makes you feel welcome! Courtney and Leah are amazing. They know how to identify problem areas and give you tips to keep up with self-care at home. 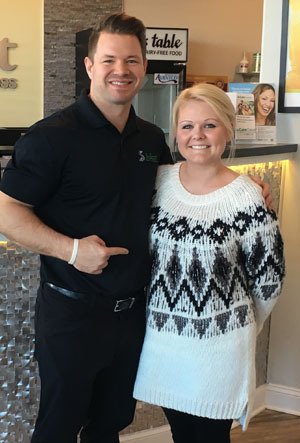 Lastly, Rachel at the front desk is always helpful and accommodating with appointments. If your an athlete, a parent, a gym rat, and everything in between, you won't regretting putting your health first with chiropractic care!." - Jackie S.